These tips are for serious travelers. Learn how airline pilots cope with changing time zones and how to beat jet lag for frequent flyers. I was talking to a friend the other day who just happens to be a pilot. We were discussing sleep schedules, and how he deals with jet lag as a pilot when he may depart Phoenix for Atlanta, then fly to Chicago and end up in Los Angeles or Portland for the night, go to sleep, and then depart Portland for Dallas to Los Angeles to St Louis the next day…And how do the airlines train their pilots to deal with jet lag? International flights can take off from Los Angeles in the dark bound for for Sydney, and land before the sun comes up, after being in the air for 15 hours. Scheduling a flight so that you land at an optimal time (either to go right to bed or in time to start a new day) just isn’t going to work when you are hopping all over the map. Why even bother trying to reset your watch? When should you eat or try to sleep? Did you know that pilots go through specialized training on dealing with jet lag and the fatigue that accompanies it? 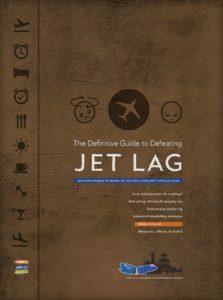 The following tips are kind of an addendum meant to supplement the tips and techniques for travelers we already outlined in The Definitive Guide to Jet Lag, yours free at https://www.gninsurance.com/free-guide-on-preventing-jet-lag/. That guide discussed the effects of light and sound, eating rhythms and exercise regimes, as well as time shifting, and how your personality affects jet lag or can help to suppress it. One thing pilots quickly discover: Some tips work for them and some don’t. Everyone is different and different personalities and styles have to figure out what works / is effective for them. Simply staying up till “nighttime” and going to bed tired just doesn’t work when you are traveling back and forth across country and do not have time to play “catch up.” In this case, pilots often keep food handy and eat when they are hungry and choose to sleep whenever they are tired. They are less likely to worry about what time it is where they are headed, and more concerned about “what time it is to them” on the plane. Food, especially healthy snacking versus heavy meals/fatty foods can also help you feel better. Sugary foods (esp. breakfasts) will definitely mess up your energy levels and blood sugar levels causing you to be up for a short time but crash back worse than before. Lay off the restaurants, or at least lay off the fries and soda. Don’t discount exercise: A walk, getting up and moving around, a few squats, a run up a flight of stairs. This was talked about in our Jet Lag Guide, but is even more important when you can’t trust the sun (or lack of it) to help your circadian clock get back on track due to too many hours in the air, or too many miles back and forth across time zones. Pilots and cabin personnel can usually be spotted exercising at three in the morning in the hotel gym, and this may be the one most important tip when having to travel repeatedly across time zones – Stay active regardless of the time of day – if you need your mind to stay sharp/active! It helps if you have a background in the military or find it easy to nod off anywhere for short periods of time. The military trains to stay up for long periods of time with heightened awareness. Those who have been in the military are also trained to “use sleep as a weapon” grabbing small amounts of sleep that helps them push for extended amounts of time. When you are tired, you are not only less likely to be sharp or at your best for business meetings, but your risk of accidents skyrockets as well. Not being aware due to fatigue can cause you to be hit by a car, accidentally step off a curb or make poor decisions that could also affect the rest of your life. Another reason to ALWAYS travel with emergency travel medical insurance. Melatonin, Ambien and Sonata are also used to help some pilots get to sleep. But as we talked about in the Let Lag guide, and as Consumer Reports talks about here, the best sleep aids are not drugs. Our friend doesn’t use them and rarely drinks coffee (beyond one cup) to get going again in the morning or when tired. These three sleep aids clear out of your system fast. 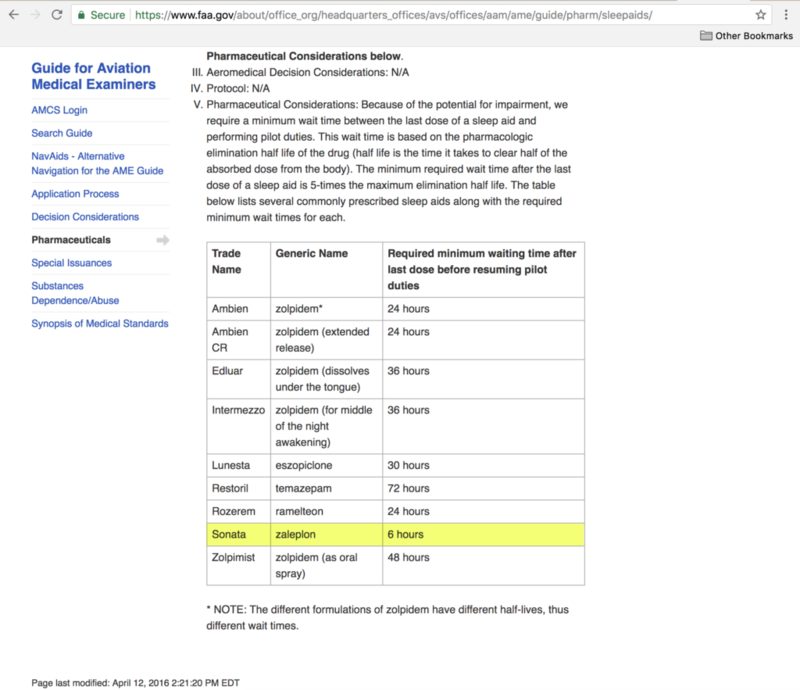 Ambien is out of your body in six to eight hours; Sonata stays in the body for only about five to six hours. They can help you get to sleep, even during the day, BUT they should never be used to try to stay asleep, or to force sleep. ALWAYS follow instructions. Sonata (Zaleplon) works very quickly, so it is important to take it just before you intend to sleep and to avoid other distractions/use it along with other recommendations in the free guide to get to sleep quickly on the plane. Try to avoid heavy or large meals right before taking the sleep aid. Over-the counter sleep aids that contain diphenhydramine, block the histamine receptors in your brain that also control wakefulness—so drowsiness is often a side effect. Those who take sleeping pills (esp. over-the-counter medications) are over twice as likely to be involved in accidents. (From a study of nearly 410,000 adults published August 2015 in the American Journal of Public Health.) Add to that, travel in unfamiliar locations, and the poor driving habits in some destinations and you have a compounded risk of testing the effectiveness of your travel medical policy. These are very short-term sleep aids and only suggested as a last resort, to those traveling for short periods. Unlike passengers, your air cabin attendants are up and moving around, communicating and “working” which helps their bodies be aware of the time much better than those sitting and often napping (with cabin windowshades down!) during the middle of the day or when they should be awake. This is also why watching movies on a flight may be one of the worst ideas ever suggested! Movies and TV both cause your mind to drift/go into a relaxed Alpha state. 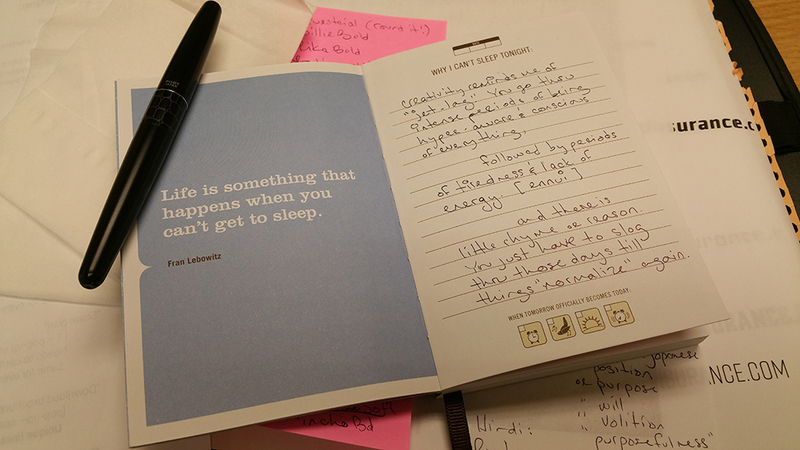 If it’s the middle of the day, you want to be exercising your mind to stay busy/stay sharp, or you should be truly sleeping on the plane if it fits into your strategy and the local (destination) time zone. As we have said before, you want to limit exposure to artificial light in the hours before bed. The 1-2 hours before trying to sleep should be a time of winding down and preparing for sleep. Plan on getting to the terminal early, so that you aren’t rushing and increasing your stress/adrenaline. You may want to wear sunglasses while in the terminal for overnight flights/red-eye flights. Decreasing your exposure to light and noise is important. Of course, just the opposite is the case during the day. Get all the exposure to light you can during the day. Daytime exposure to light—both sunlight and even artificial light if the airline dims the cabin lights during daylight hour flights—can help strengthen circadian rhythms and boost your daytime alertness, leaving you better prepared to sleep when evening comes, at your destination. 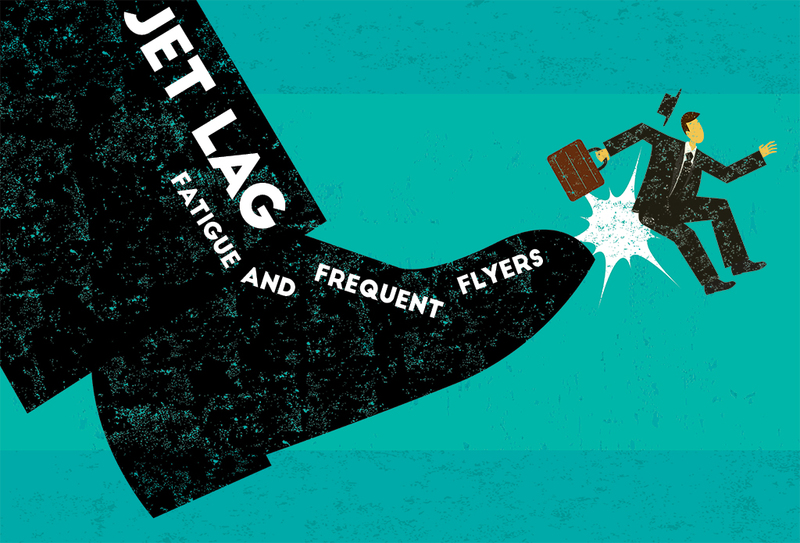 A Little Secret: Airline pilots are NOT good examples of how to cope with jet lag since most of the time they are not trying to adjust their circadian rhythm to any given destination. However, learning to cope with fatigue, working at a high level of performance, is a good skill that most pilots learn over time, and that you should master as well. That is, if you are going to be frequently in the air crossing time zones for work or meetings. NASA fatigue studies showed that when we’re tired we’re less likely to interact socially. 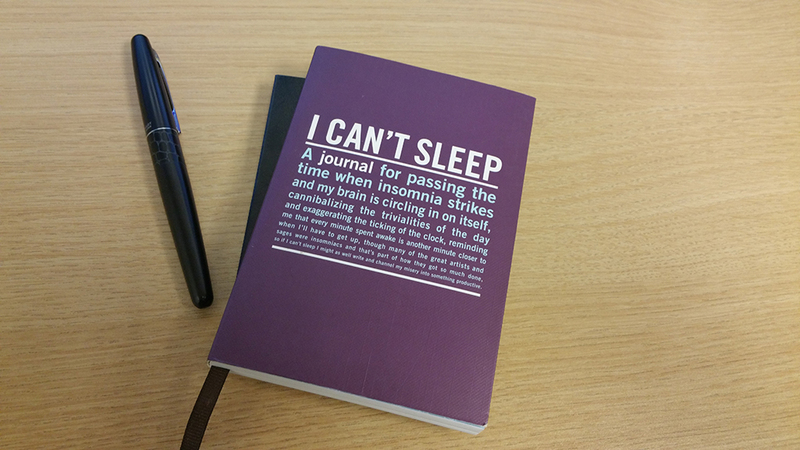 As our Advanced Jet Lag Strategies guide pointed out, take time to engage with others (rather than just working alone on your laptop) as the interaction will help you cope with tiredness and jet lag. Spend the money to access the internet/WiFi and use it to connect/text coworkers, family, be conversing via email,…Just be mindful of those sitting next to you. No one like a “loud talker” or a chatty seatmate at 3am! And make sure you use “social interaction” strategically based either on your destination’s current time or the time back home depending on your travel schedule and goals. A little advice, airline pilots are NOT good examples of how to cope with jet lag since most of the time they are not trying to adjust their circadian rhythm to any given destination. Get our free guide and then consider adding these tips to that advice, since this article is for those who must travel a lot and do not have time between trips to let your body adjust to a new time zone. Pilots also quickly discover that some tips work for them and some don’t. Everyone is different and different personalities have to figure out what works for them. So don’t be afraid to try different things and see what works best for you. Because not every tip will not work for every flier, especially tips dealing with jet lag for frequent fliers and jet lag for pilots and air crews. Hopefully you have gained a few more ideas here to try out on your next trip. If you do have to be in the air repeatedly without a chance to adjust to any given local time zone due to work or business meetings, then the above tips will hopefully help you until you get back home and back on a regular schedule. Consider whether it is worth trying to adjust to a new schedule or just stay on your “home time zone.” while using coffee and sleep aids only as needed to help you function. Eat healthy, smaller meals and snack often. Avoid sugar overload especially at breakfast. Try to say active and exercise. Take the stairs, walk the block and a half versus calling Uber. Get natural sunlight as much as you can unless you are trying to stay on another clock/time zone at least four time zones away. Be mindful that you should always have travel insurance when flying frequently. Unlike a lot of other travel insurance brokers we have more options including annual plans that cover unlimited trips! Also, we have plans that cover you inside the USA (or travel to the USA!) if away from home and on a “skinny network” with limited coverage and limited hospital networks. And it’s much cheaper than ACA-coverage so that might be a pleasant surprise. Have a question or don’t see what you need? Drop us an email at info@gninsurance.com or call 866-636-9100. Let us know what you think. Are you tired of worn-out ideas like “drink more water”? Do you see any difference between frequent travel/extended travel (without the chance to recover) and vacation travel/travel with at least a minimum of a few days before having to return home? Do you use different strategies that help you perform at a high level? Let us know below in the comments. Our owners, Jeff and Doug, are frequent flyers traveling to Indonesia and events throughout the country. 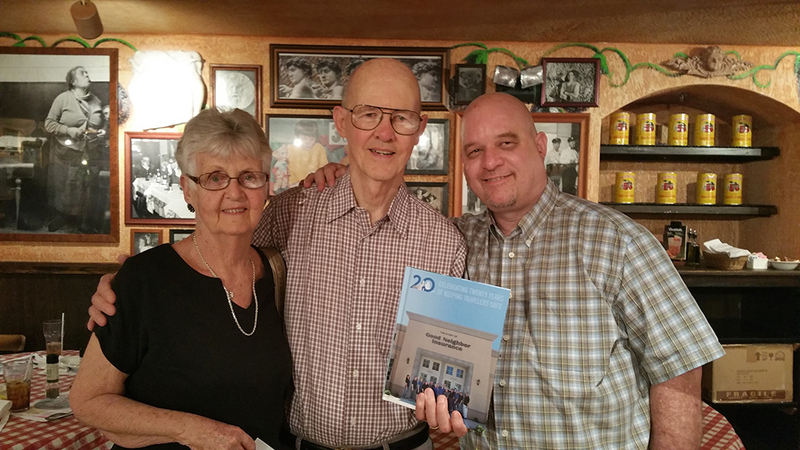 Over the last 20 years they have kept to their values of keeping travelers safe. Affordably.